Oregon will play Wisconsin in the first round of the NCAA tournament. Let’s get this out of the way. Wisconsin is formidable, but they are beatable if Oregon does a few things right. The NCAA Selection Committee did Oregon a favor on Sunday, scheduling the game in San Jose, barely a half travel day away. So on game day, the Ducks will likely be greeted by a lot of Duck fans. The Committee also gave them a Friday start, and having an extra day to rest their legs after four games in four days is a good thing. Okoro’s development gives Oregon a long, tough front line with depth. Oregon’s size inside can help them in this game if the big men stay out of early foul trouble. So, don’t gamble on defense. Make the extra pass to make sure to get good shots, and don’t turn it over. In other words, they can win if they do more of what they’ve been doing. Oregon has as much talent as Wisconsin, but the Badgers are extremely well coached. It should be a good game, with a score in the mid 60s to 70s. Look for more on it later this week. Was the Ducks’ four wins in four days the greatest late-season dash to end the season in Oregon men’s basketball history? Absolutely. Oregon is the first team to put up four wins in four days since the Colorado Buffaloes did it in 2012. That Colorado squad rode the momentum all the way to the Sweet 16. Oregon has that potential as well. Wooten blocked four, and Washington couldn’t get anything going in the paint. In the last win of the four, against Washington, the Ducks stood up defensively, communicated, and didn’t let the Huskies penetrate and kick to shooters. 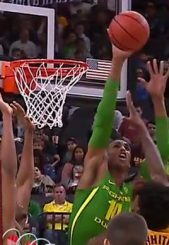 Kenny Wooten’s four blocks and altering of another half dozen changed the game for the Ducks. Paul White hit a couple of key shots from the corner, and Louis King walked into the arena with a limp and gutted through it. Oregon may have its spiritual leader in Francis Okoro, but its on-court leader is Payton Pritchard. The Oregon junior is making near-perfect decisions every time he has the ball, and now instinctively knows where his teammates want the ball to score most easily. Pritchard has decided he’s going to the rim every chance he gets and it’s paying off. No other player in the last decade has done this as consistently as he does. He’ll lead the break to the rim, or beat his man off the dribble. But when he gets to the rim he jump stops, pivots, fakes, pivots, fakes a pass or a shot again, and then … a quick layup. His stopping means big shot blockers can’t run and jump to block his shot. Right before he shoots, it’s just two guys standing on the floor, and it becomes a who can get up quickest contest. Pritchard gets them off-balance then goes up and scores. He uses his arms to get into the shot blocker and weave the ball around him. That’s great footwork and knowing the game — old-school, beautiful basketball. He doesn’t go over defenders; he outplays them. 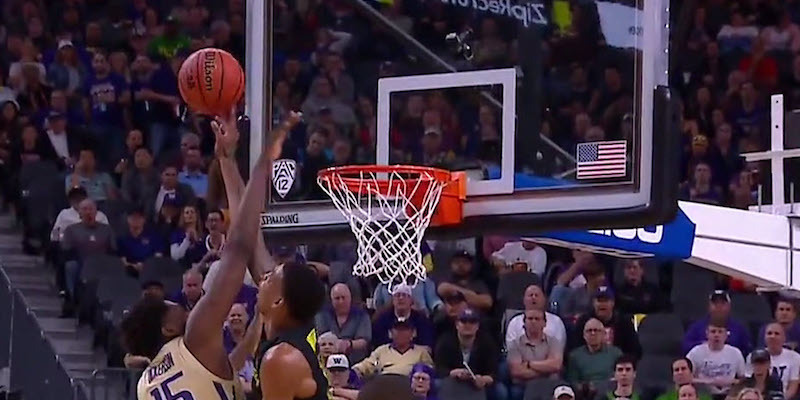 Oregon took charges and made selfless plays on D all night in the Pac-12 title game. 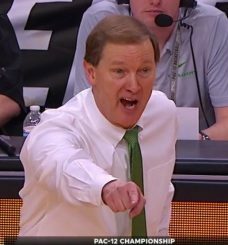 Coach Dana Altman has been preaching this all season, just as he does every year. And it’s true. There are bad shooting nights and tough arenas to shoot in. There are stadiums with deep backgrounds and depth issues too. But no matter where you’re playing, you can always play defense and rebound. Right now the Oregon defense is playing with heart and a willingness to help the helper, and to force shooters to take shots they don’t want. Even Washington Coach Mike Hopkins mentioned it. Oregon’s switching defenses in the middle of a possession are tough to deal with, especially if you don’t have time to prepare for all of them. Washington saw it three times this year and still didn’t have it down. Wisconsin will have four days. Even with the Stanford loss, the Oregon women’s team is still in great position to play for a title, and that’s the goal. The Ducks just didn’t hit shots against the Cardinal. Assuming they take care of business in Eugene, expect the Moda Center to be sold out for the women at the regionals. You have to like the Ducks’ chances to advance to the Final Four in Tampa and win the championship. They’ll be staying in the West before that, and no matter who they face in the regional final, it’ll be in Portland. Should it be Mississippi State, the only worry I have is that while Oregon beat the Bulldogs earlier this year, doing it twice isn’t easy. This week, let’s just sell it out in Eugene and win two. Oregon is the first team in Pac-12 tournament history to beat the three, two and one seed. Dana Altman. A future Basketball Hall-of-Famer leads the Ducks. Coach Altman signed a new contract this week, and there’s no coach in college basketball that’s more deserving, or a better fit for a program. Altman’s 19 wins in the Pac-12 Tournament are the most by any coach in conference history. He now has 642 wins all-time. That’s 40 wins more than the guy everyone said Oregon should hire, Tom Izzo. Still think he isn’t a Hall-of Famer? Next year he’ll pass John Wooden, then Ralph Miller. Assuming he coaches through his contract for another seven years and averages just 20 wins he’ll have 780 wins — good for sixth all-time. Pritchard had 22 assists and only four turnovers in the tournament. Wooten had a tournament-record 10 blocks in the four games. The Balloon Game. A quick story for anyone who hasn’t heard it. Washington had balloons in the rafters ready to be dropped after the game against Oregon at the end of the season. Oregon’s coaches took the players out before the game to show it all to them. Apparently, that fired up the Ducks just a little more than usual, and they wound up spoiling the party. The same thing happened in Bill Russell’s final game when he and the Celtics faced the Lakers. Los Angeles had balloons set to drop. Russell and his teammates saw that and were having none of it. Just like Oregon, they went out and won. Wisconsin freshman Tai Strickland is the son of former Portland Trailblazer Rod Strickland. Badger sophomore Kobe King is the cousin of former Michigan Fab Five member Jimmy King, and the son of former NBA player Chris King. Two Oregon teams are headed for the NCAA Basketball Tournament. Stay tuned as we break down each one’s path for success.